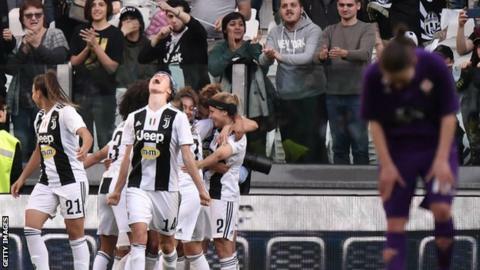 Juventus Women beat Fiorentina 1-0 in their first game at the Allianz Stadium in front of a capacity 39,000 fans - a record for a women's game in Italy. Tickets were free for the league game and supporters flocked to the stadium in Turin, smashing the previous record of 14,000 for a women's match. Ex-England international Eniola Aluko featured for Juve, with Sofie Junge Pedersen scoring the winning goal. Scotland's Lana Clelland played for Fiorentina. Only 121 Fiorentina fans reportedly made the trip. Last weekend, a crowd of 60,739 watched Barcelona beat Atletico Madrid 2-0 at the Wanda Metropolitano - a record for a top-flight domestic women's game in Europe.